When I was a youth pastor, the students used to call me the king of rabbit trails. They knew that whenever I taught, there was a chance I would end up "off-topic" following some rabbit trail that had come up. I would just say to them, "remember, every trail leads somewhere." One of the greatest fears many small group leaders have is that their group will regularly be derailed by "rabbit trails" and they'll never accomplish their goals. While leaders should be careful to not get needlessly sidetracked too often, I'd like to suggest that some value can be found in rabbit trails. Rabbit trails can be a great way for a group to develop its own identity, as well as for group members to vocalize what is really happening in their life in that moment. One of the surest signs your group is engaged in healthy rabbit trails, is emotion, loud and raucous humor or sometimes painful and intense tears. Be careful not to "take sides" in a debate. From time to time in your group discussions, you will happen upon a controversial topic which launches your group into a debate. Particularly, I'm thinking of the type of "disputable" issues like those addressed by Paul in Romans 14. As your group discusses the issues, you will very likely have an opinion; but it is important that you wait for the right time and use the right methods to share your thoughts. As a group leader, there is always the potential that some in the group may be hesitant to voice their opinion if they feel it is contrary to your position. Your first responsibility is to nurture an environment which allows everyone the opportunity to share their thoughts. Peel the Onion with Questions. Have you ever peeled an onion? You probably cried while you did. The point of this suggestion is NOT to make your group members cry with the questions you ask. As you peel each layer of an onion, you discover that another layer can be peeled off until you get to the very heart of the onion. People are like onions. Typically, when asked a personal questions, the first answer they give will not fully reflect their heart. Likely, it will be an answer that barely scratches the surface of who they are. That answer needs to be peeled by asking another question. Affirm all expressions of opinion from each group member. A subtle different exists between agreeing with every opinion and affirming every opinion. Agreeing with someone's opinion means you are confirming that they are right in their assertion. While you will often have opportunities to agree with members of your group, you should not always agree. Group members will certainly occasionally make suggestions or verbalize opinions which are out of line with Scripture. On those occasions, you will do great harm to the person as well as the other group members if you agree. It's always okay to disagree. Affirming someone's opinion simply means you are communicating your gratitude for their willingness to share. Regardless of whether or not an opinion is "right", the person sharing it has chosen to be somewhat vulnerable. Affirming their choice to participate is crucial to keeping a discussion rolling and cultivating a welcoming atmosphere. More discussion suggestions tomorrow, but for today here is something we're planning to do this fall. If you're involved with LIFEgroups at all at Calvary, I'd love to get your feedback/critique/ideas about this. Thanks. What is a LAUNCH group? A LAUNCH group is a special six-week LIFEgroup designed to help people get a small taste of biblical community. LAUNCH groups meet six times to discuss a predetermined topic, often based around a video teaching. Each LAUNCH group will complete their six weeks with a "Service Party". Following their initial six weeks, each LAUNCH group has the opportunity to continue meeting together if they choose. 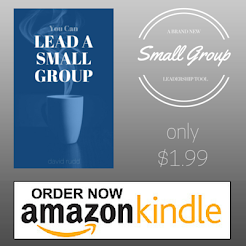 A LAUNCH group may or may not become a long-term LIFEgroup. Read all ten commandments suggestions here. I remember a story we used to read when I was a child that highlighted the difference between listening and hearing. A child regularly heard her parents instructions, but didn't really listen. As a result, she continually disobeyed, and ended being confronted about her poor listening habits. In a LIFEgroup setting, it is easy to hear what everyone is saying, but to not really listen. Nothing can kill a discussion faster than not really listening to what others are saying, and nothing will promote discussion more than people's realization that they are really being listened to.